What’s wrong with second grade? As a teacher, consultant, longtime educational specialist, it is sad to often see fewer smiles and sparkling eyes with each advancing grade of school. Rather than continuing to believe that learning is fun, cool, an ultimate aim, too many children dumb down, hide their talents, and proceed in a lock-step method of learning that doesn’t fit them and holds little appeal. It doesn’t have to be that way. Miraculously, my children fought the school battle and won – proud of themselves as topnotch learners throughout their k-12, college and graduate school years. I want the same for my grandchildren and yours. I want little children to hear and believe from their first year that learning is exciting, reading introduces you to people, places and things unknown, and asking questions and exploring possible answers is the key to advancement. 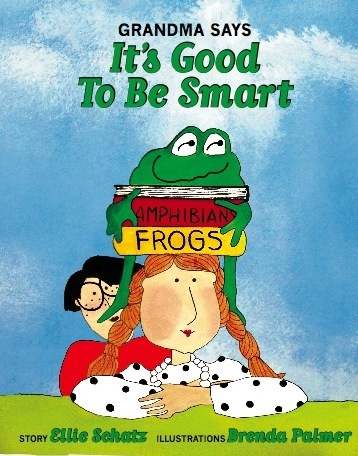 I hope “Grandma Says It’s Good to Be Smart” helps many children to firmly believe that second grade and all the grades after that will still be “learning-is-fun” — and that creativity is good too even if not usually when spelling! This entry was posted in Children's Books, Creative Kids, Early Learning, Grandma Says It's Good to Be Smart, Growing up smart, Young Children and tagged ages 0-7, be smart, caring about ideas, encouraging creativity, grandparent alert, learning is fun, learning through exploration, learning to read, life-long learning, LinkedIn, parent alert, pre-k to 2nd grade learners, raising smart children, reading with your little one. Bookmark the permalink.